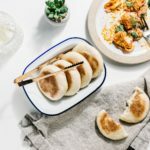 Cute little fluffy, pillowy Moroccan pita breads, made on the stove! I love bread and I especially love making it because I’ve always dreamed of being a bread baker. I even did the whole cultivate wild yeast thing and grew my own starter. I made one glorious loaf of sourdough. Just one. Why didn’t I make more? It turns out that too much yeastie in the air makes me beastie. I broke out like crazy. It was pimple after pimple like I was fourteen again. I was also strangely itchy and had random rashes. I couldn’t figure out why until Mike pointed out that Sir Sourpan (that was my starter’s name, may he rest in peace) was hanging out on the counter, releasing his yeasties into the air. Anyway, long story short, wild yeast loves me too much and I love making bread. After the whole wild yeast experiment, I’m now sticking to instant yeast because it hangs out in the fridge and doesn’t make my face look like a pizza. Win-win! My latest in bread making experiments is this Moroccan pita bread, called batbout. 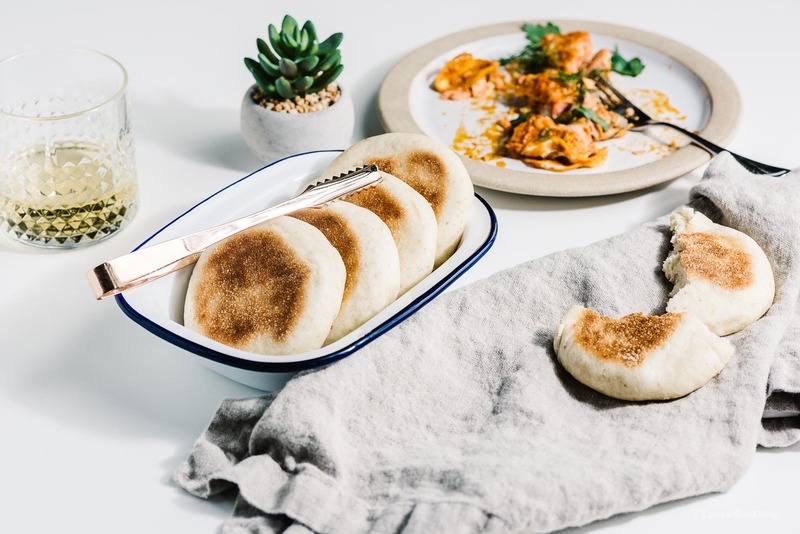 Mike and I had a little Moroccan themed dinner party and we wanted some bread to go with so Mike did a google and came up with a list of Moroccan breads and this is the one that stood out to me because they look like little cute round pillows. They’re really easy to make and even cuter when you cook them up. Yes, I said cook because they’re made in a pan instead of baked in the oven. 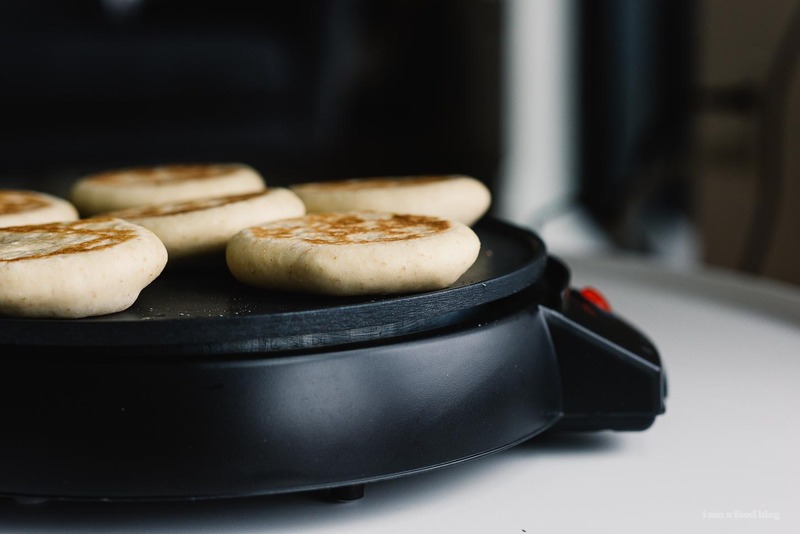 After they’re shaped, a pan is heated up and after you add them, they puff up as they cook. 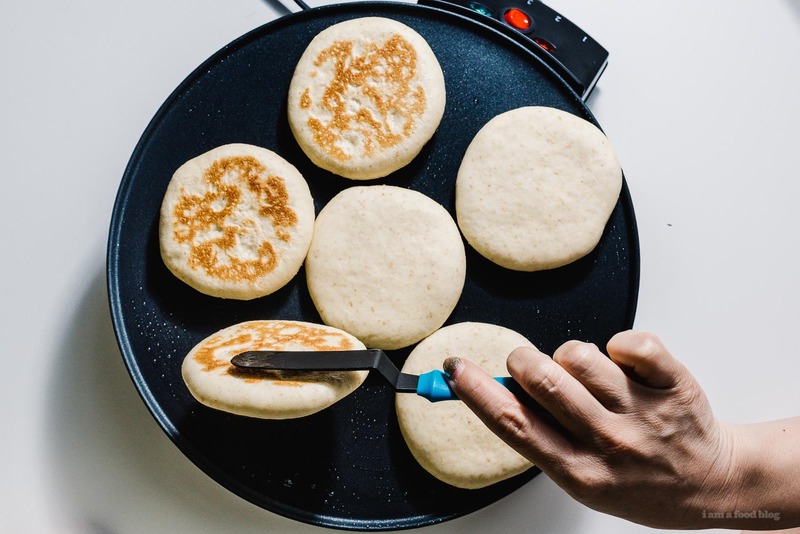 I’ve seen them made with oil in the pan and without – it appears that it’s more traditional without but I saw many recipes with so I just used a small slick of oil to get a nice golden color. They kind of remind me of English muffins, both in roundness and fluffiness. But that’s where the similarities end. They don’t have a very holey interior. They’re more chewy and flavorful, probably because of the a mix of flours: typically white, whole wheat, and semolina. I loved these little breads and Mike says that they’re my best bread yet. You should definitely make them because they’re easy and they taste awesome. I can’t wait to make some mini mini ones and stuff them for tiny sandwiches! Mix together the sponge ingredients and set aside for 10-15 minutes, or until frothy. Meanwhile, in the bowl of a stand mixter, stir together the flours, sugar, and salt. Add the yeast mixture, oil, and water. Stir until everything comes together into a dough. Use the dough hook to knead on medium-low, for about 10 minutes, until the dough reaches the windowpane stage – take a piece of dough about the size of a golf ball and stretch it out between your fingers and thumbs. If you can stretch it without the dough breaking and you can see through the stretched dough, you’re good to go. If the dough doesn’t windowpane, knead a bit longer. Divide the dough evenly by 20 (I used a scale and weighed each portion to 45 grams) and shape each portion into a ball: bring the edges towards the center and tucking into balls. Cover and let rest for 10 minutes. Roll each ball out until it is 1/8 of an inch thick. Place the rounds on a tray or a clean dry towel and cover and let rise for 1 to 1.5 hours, or until light and puffy. To cook, heat up a very lightly oiled cast iron pan or skillet over medium heat. You want the pan to be quite hot. Carefully move the rounds to the skillet and cook in batches, flipping every so often, until they are puffed, cooked through, and brown on both sides. Cool slightly before enjoying! Yum! That bread looks so tasty! I’ve been on a bread-baking kick lately too. Had a bunch of fresh yeast to use up, so I was baking everything I could think of. I had no idea that yeast in the air causes acne though! Lucky for me, sourdough isn’t really my jam. About how long did it take for them to cook through for you? Soft little pillows of love…happy making and feasting of course. I bet you can’t eat just one. 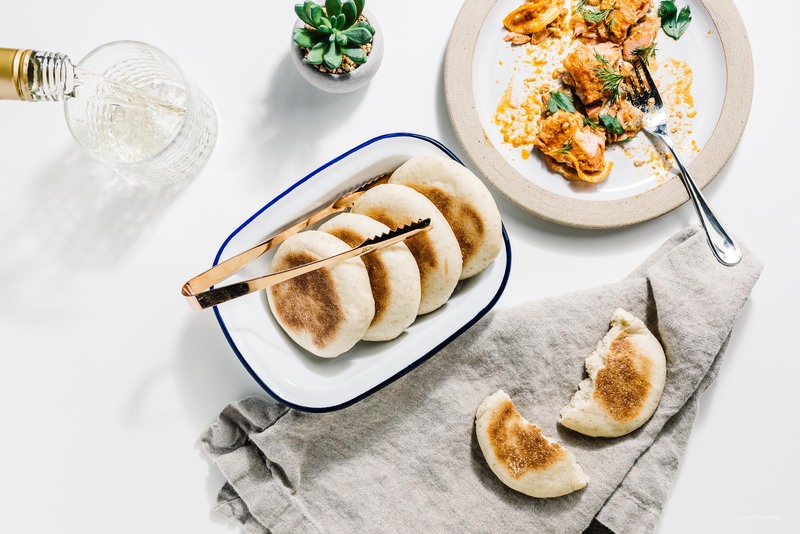 It’s a shame about your relation with sourdough..Have you tried keeping it in the fridge with a lid on (weekly feedings)? I have a sourdough starter that i have kept in the fridge for weeks (honestly forgot about it).. and then brought out to feed daily, and it came back to “life” within two days. Once your starter is active put it on the fridge. Whenever you want to use it (up to a week), take it of and feed it (don’t forget to make more than what the recipe cals for). It will be ready to use 12h later (up to 14h-16h depending on the temperature). Use what you need and put the rest back in a jar (lid on) on the fridge. For me it works well feeding it late afternoon so I can use it the next morning. Can I make these ahead of time and then reheat before serving? Would they reheat well in a toaster oven? those look so fluffy and delicious! I love this recipe but am having trouble baking with consistency. Is there any chance you can provide the measurements in weight? Waiting for weight measurements too!